PACK SIZE: The box contains 25 strips. 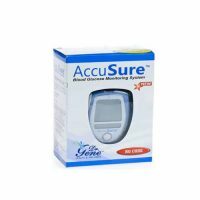 FEATURES: Blood Glucose Test Strips intends to be used with Blood Glucose Monitor for monitoring presence of Blood glucose level . 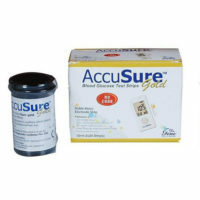 This is auto coding products.Blood Glucose Test Strips sensitivity is equivalently calibrated to plasma results in factory. This is CE approved. OMRON Blood Glucose Test Strips HGM STP1A is used only for monitoring blood sugar with Omron glucometer models HGM 112 and HGM 111. Take fresh capillary & contain blood from finger tips or palm in order to test with this Omron glucometer strips. The HGM-STP1A blood sugar test strips are used for testing with the Omron glucometer models HGM 112 and HGM 111 only. This is one time used strips. Please follow the instruction manual in detail before testing with the above said glucometers. Don¢t expose these test strips in atmosphere for a long time. Close the box tightly, once the strip is taken away from the box for testing so that we can prevent the strip becoming damage by exposure to air. Avoid the use of strip box is without proper seal or with damage don¢t use them & don’t use expired strips. Also do not refrigerate or freeze the strips. Before taking the test strips from the bottle, wash your hand properly with soap and dry it completely with towel. 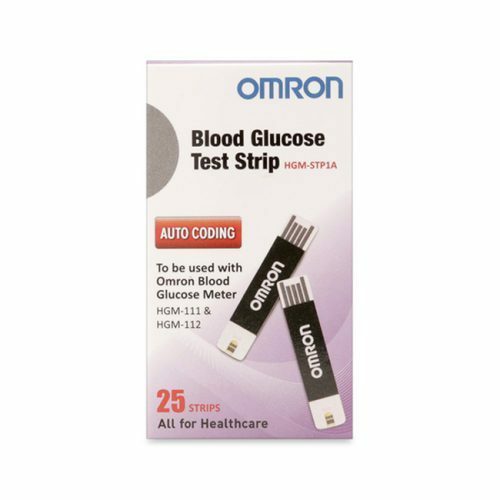 Take one Omron blood glucose test strips HGM STP1A from the strip bottle carefully and close it tight immediately after taking strips. Insert the test strips into Glucometer slot carefully. Machine will be switch on immediately after the insertion of strip. After 2-3 seconds, the blinking drop signal will display on meter. By using lancet and lancing device, take a small drop of blood from finger tip. Apply this small drop of blood on to the tip of the test strip. Remove your finger once when the countdown starts on the screen. Result obtained at the end of the countdown. After noting the reading, remove the test strip and then meter will switch off immediately. 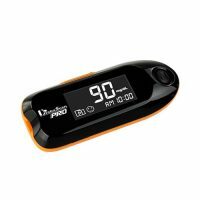 Reading will be stored in the memory of Glucometer with monitoring details time & date. Body energy needs have to be fulfilled by sugars or glucose, and thus it is so critical that its level remains within the optimal range. If blood glucose rises above a certain level, it starts damaging blood vessels, nerve cells and it is harmful to almost every cell of the body. If blood glucose drops below specific range, then that is even more dangerous; This is acutely life-threatening. Low glucose means energy deficit in body, especially for the brain, which is very energy hungry organ. Brain is about two percent of the human body weight, but it consumes almost one-fifth of energy. If you measure the blood glucose with Omron glucometer strips, then ideally blood glucose should remain between 70-100 mg/dL (fasting range, measured preferably after 8 hours of last meal, but not later than 12 hours). 100-120 mg/dL is a signal for something is wrong with the body, though it is still not diabetes. Any value above 120 mg/dL indicates diabetes. Blood glucose below 70 mg/dL can be life-threatening. Blood glucose goes high in diabetes, which disease caused by genetics, lack of exercise, consuming the wrong kind of food. Except in 10% of cases when diabetes is due to insulin deficit and it is an autoimmune disease, the vast majority of those with diabetes suffer from insulin resistance. If found that sugar levels are high, then lifestyle changes must form the vital component of any blood sugar management program. Medications used with lifestyle changes fail help. Among lifestyle changes, this is necessary to start regular aerobic exercise, eat food that is low in fast absorbing sugars, eat good quality fats, and consume lots of dietary fiber. In some cases, stress may be the reason for high blood sugar, and Yoga or meditation may help in such cases. People must understand that in most cases natural methods fail just because people do not stick to them long enough. One cannot expect to reverse the side effects of decades of poor lifestyle in a month one or two. Thus for better treatment make practical exercise and dietary plans and stick to them long enough. Most people can expect to benefit in three to six months after following blood sugar control tips. Low blood glucose is less frequent, but this is life-threatening condition. This is often the result of insulin overdosing, which occur in some individuals who have more daily fluctuations, or those who do not use Omron glucometer strips to keep track of blood glucose. There are certain oral drugs that increase the insulin secretion may also lead to low blood glucose level. Symptoms of low blood glucose are excessive sweating, extreme fatigue, light headedness, and even sudden loss of consciousness. Most people would benefit by eating something sweet and sugary immediately or taking a spoon or two of glucose. If the condition is not controlled by glucose ingestion alone, then doctors may prescribed specific medications and may resort to intravenous fluids.